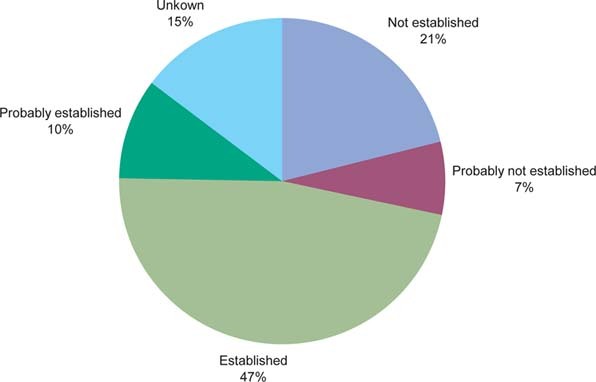 A global account of inland fish introductions and transfers was first published by Welcomme (1984, 1988); this dataset has been updated to include other taxa and marine species in the FAO Database on Introductions of Aquatic Species (DIAS). Welcomme and Vidthayanon (1999) used information in DIAS and recently examined the introductions and transfers in Southeast Asia, particularly in countries of the Lower Mekong River Basin. According to DIAS (Table 1), 12 tilapia species (six Oreochromis spp. ; two Sarotherodon spp. ; and four Tilapia spp.) and one hybrid have been introduced into 30 countries the region, including the Taiwan Province of China and Hong Kong Special Administrative Region (Hong Kong SAR). As reported in Welcomme (1988) aquaculture was the prime reason for the introductions of tilapias (Table 1). For the vast majority of the records in DIAS there has been no evaluation of the ecological or social/economic impact of the introduction (DIAS - Figure A). However, of the impacts assessed, there were more positive social and economic impacts reported than negative environmental impacts. Although Welcomme (1988) and others (Beverton 1992) reported that the majority of introductions did not result in the establishment of alien species in the wild, the records in DIAS indicated that most tilapia introductions to Asia and the Pacific were successful at establishing reproducing populations (DIAS - Figure B). Of the species introduced to Asia, O. mossambicus and O. niloticus are by far the most important from both production and scientific points of view. These species are now widely distributed in most of Asia and occur in natural and quasi-natural waters making them a part of the fish fauna of most of tropical and even sub-tropical Asian aquatic environments, thus creating an increased concern among some conservationists and environmental lobby groups (Pethiyagoda, 1994). Tilapia species tend to hybridize relatively easily, a trait that had been utilized in tilapia aquaculture development from the very early stages (Hickling, 1960; 1963). Introgressive hybridization in cultured stocks (Macaranas et al., 1986) and self-recruiting stocks (De Silva and Ranasinghe, 1989) of tilapia species, particularly between O. mossambicus and O. niloticus, have been reported from many countries. The "red tilapia", a hybrid between strains of O. mossambicus x O. niloticus is currently considered as important to aquaculture in Asia (Welcomme and Vidthayanon 1999). Several species of tilapias (O. mossambicus, O. niloticus, O. aureus, O. hornorum and Tilapia zillii) were introduced to the South Pacific Islands in the mid-1950s. Information about those introductions, particularly the introductions to relatively small islands, is scarce (Nelson and Eldredge, 1991). However, introductions to the larger Melanesian islands such as Papua New Guinea and Fiji are relatively well documented (Andrews, 1985; West and Glucksman, 1976; Werry, 1998). It is believed that most of these introductions were designed to improve local fisheries through stock enhancement, provide live bait for the tuna industry, and contribute to aquaculture, as well as biological control, (e.g. aquatic weed and mosquito control). There have also been inadvertent introductions of O. mossambicus to some islands; most notable was the introduction to the Fanninf Atoll in one of the Linne Islands of the Polynesian group (Lobel, 1980). Apart from the origin of the early introductions, which were mainly from Asia (Singapore, Malaysia, etc. ), later introductions and transfers between islands are not well-documented. The origin of the first introduction of tilapias into Asia is not clear except for the fact that, by 1950, O. mossambicus had spread into many Asian countries. At present, tilapias are a part of the fish assemblages in most Asian countries. 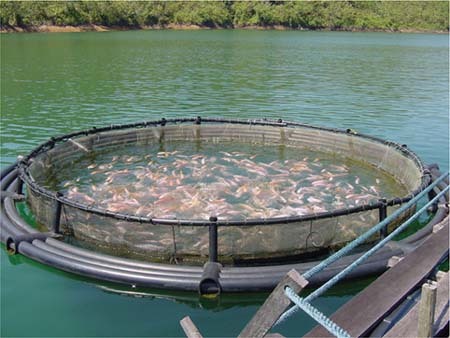 In most countries, tilapias have had a noticeable impact on fish production, although the contribution is not officially reported to FAO by many countries. It is difficult, if not impossible, to single out a country in which tilapias have not become established after introduction. The introduction of O. mossambicus to Asia was hailed as the solution to the short supply of animal protein in the region (Lin, 1977). However, due to its recurring problems of overcrowding and stunting in small ponds, O. niloticus became the preferred species due to its higher growth rate, a reduced tendency to stunt and better consumer appeal (Smith and Pullin, 1984). In spite of the rather wide-scale introduction into Asian waters, there is no explicit evidence to indicate that tilapias have been overly destructive environmentally; nor is there evidence to indicate what effect these species have on biodiversity. Tilapias continue to make an important and a significant contribution to fish production in Asia, both in the inland capture fishery and aquaculture sectors. Bartley et al. (in press) reported 1 166 737 tonnes of total tilapia production from many ASEAN countries and China. This is an underestimate of the production as many ASEAN countries have introduced tilapias and are farming them, but do not report production to FAO. Although small-scale fisheries and rural aquaculture share many commonalities and are often difficult to separate completely (e.g. culture-based fisheries in Sri Lanka), the two sectors are treated as distinct entities in this document. In this document, Asia and the Pacific refers to countries in Asia and Oceania under FAO regional classification.